Lightly oil 8 x 125ml pudding basins or dariole moulds. In a thick-bottomed pan, heat the double cream, 75g caster sugar, vanilla pods and seeds, and orange zest over a medium heat. Bring to the boil, then simmer until reduced by about a quarter to 750ml, stirring frequently so the cream doesn’t burn on the bottom of the pan. Place the gelatine leaves in a bowl of cold water, snapping them in half to fit, if necessary. Leave to soak for 5 minutes until very soft. Drain off the water and stir the gelatine into the hot cream. Strain into a clean bowl and allow to cool slightly - this takes around 20 minutes. Stir in the buttermilk and divide between the prepared moulds. Chill for 2-3 hours, until set. For the praline, scatter the pistachio nuts over a lightly greased piece of foil on a baking tray. In a small clean pan, melt the remaining sugar with 4 tbsp cold water over a medium heat and boil until it caramelises and is golden in colour. Pour over the pistachios and leave to cool. Once cool, break into pieces. Preheat the barbecue or a griddle pan to high. Halve the peaches, remove the stones and cut each half into four. Cook the peach slices for 1 minute or until the sides are lightly charred. Turn out the panna cottas by running the tip of a knife around the edge before briefly dipping the moulds into hot water and inverting them onto plates. 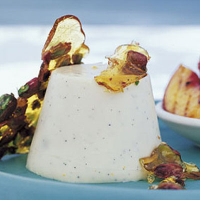 Serve with the peach slices and shards of praline.